RBTH presents a selection of views from leading Russian media on international events, featuring reports on Russian Prime Minister Dmitry Medvedev’s visit to Vietnam, the possible discussion of the deployment of UN peacekeepers to Ukraine, and the U.S. and Iran’s differing takes on the recent nuclear deal between Tehran and the P5+1. 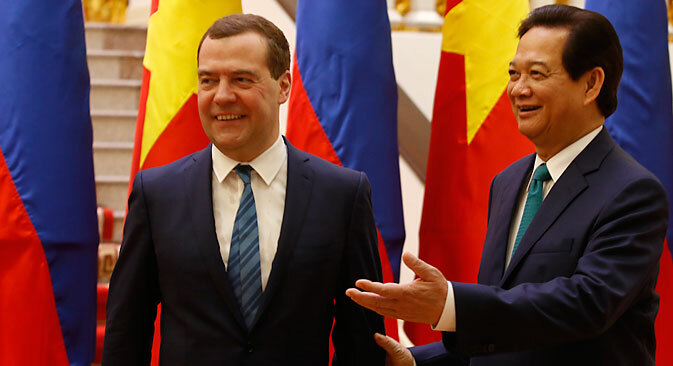 The daily tabloid Moskovsky Komsomolets reports on the outcomes of Russian Prime Minister Dmitry Medvedev’s visit to Vietnam. Despite the overall tension in international relations, the Russian prime minister’s visit was significant primarily for bilateral economic relations. During the visit, a raft of bilateral agreements were signed, including a memorandum between Russian oil producer Gazprom Neft and the Vietnam Oil and Gas Corporation, a memorandum on upgrading power plants in Vietnam as well as a cooperation agreement between Russian Railways and the Vietnamese Railways state company. In addition, the two sides discussed the prospects for developing nuclear energy cooperation: Russia expects that an agreement on building a nuclear power plant in Vietnam will be signed very soon and a Nuclear Science and Technology Center will be set up. Furthermore, Vietnamese Prime Minister Nguyen Tan Dung said that in 2015 Hanoi plans to have everything in place for signing a free trade zone agreement with the Eurasian Economic Union. The Vedomosti business daily reports that the foreign ministers of Germany, France, Ukraine and Russia may soon hold a meeting to discuss the possibility of deploying a UN peacekeeping contingent in Ukraine. The deployment of peacekeepers implies agreement by both warring parties, otherwise it cannot take place, former Russian Deputy Foreign Minister Anatoly Adamishin told the paper. “I think Poroshenko is running a bit ahead of himself; he should have first reached an agreement about this with Donetsk and Lugansk,” he said. For his part, Ukrainian pundit Vladimir Fesenko told Vedomosti that a decision on deploying peacekeepers, let alone at the UN level, could only be taken with Russia’s approval. A peacekeeping contingent is a step towards freezing the conflict but it is unlikely to happen soon, he said. According to Fesenko, Russia would be ready to discuss the issue of peacekeepers only if the Minsk deal collapses and hostilities are resumed. The Nezavisimaya Gazeta daily reveals that after the P5+1 and Iran nuclear deal was announced, the U.S. and Iranian governments disclosed details of the agreement reached that revealed a difference in the two countries’ approaches to the deal. The Iranian version of the agreement stresses that despite a reduction in the military aspect, cooperation between Tehran and the P5+1 in the nuclear sphere will grow, whereas the American version says nothing about this cooperation. The main difference between the two documents concerns the lifting of sanctions, the paper continues. According to Nezavisimaya Gazeta, the U.S. side speaks of a step-by-step procedure, to be linked to Iran’s compliance with the obligations it has undertaken, whereas Iranian officials presented a variant featuring “an immediate lifting” of all sanctions.